Specializing in Clay Parties, Art Lessons, and Classes. 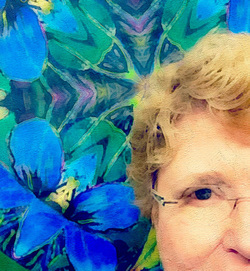 ​Darlene is a native of Indiana from Montgomery County and later in life moved to West Lafayette and pursued her education and passion for art at Purdue University, there; she received her Bachelor and Masters of Art degrees. She has worked with renowned artist Judy Chicago. She has art works in many private and public collections. Darlene has been and active in solo and group shows; also teaching and art residencies in the community and now works in her painting and sculpture studio at the Bindery. I progressively create taking in happenings around me by observing details in everything; shadows, shapes, the rhythm of steps, architecture, conversations, relationships, and the journey of my day-to-day. I often daydream by imagining lines that would be created by people walking through their routines (if they had paint on their shoes), and how those lines cross each other but the people are disconnected. I take the observations and turn them into images that make up my visual vocabulary in the environments that I create on canvas, board, paper, clay, or fabric. A current graduate student at Purdue University. Priya grew up in Nebraska, went to school in St. Louis, and has been living and studying in Lafayette for six years now. She loves creative endeavors of any kind. But, pottery stole my heart. A freelance, interdisciplinary artist & Lafayette native.